Shane Van Gisbergen leads Mark Winterbottom on his way to victory during Saturday’s race at Pukekohe. (Daniel Kalisz/Getty Images AsiaPac photo). PUKEKOHE, New Zealand — After an eventful race, Shane Van Gisbergen took Saturday’s race at the ITM Auckland Supersprint. Qualifying was a torrentially wet affair, leading to it being cancelled. Cameron Waters won pole based on his time from Friday’s practice, with Whincup second. Race time was dry, though there were a few wet patches, but nothing too serious. Whincup got the jump on Waters, while Shane Van Gisbergen dove down the inside of Mark Winterbottom for third. Scott McLaughlin sat fifth, with teammate Fabian Coulthard in ninth. Whincup led Waters by three-tenths at the end of the first lap. Whincup came out of the Turns five/six/seven complex and skidded on a puddle, but didn’t lose the lead. He skated into five on lap three, and while he kept it together, the setup he had led him to struggle in the mixed conditions as he chose a dry setup, as had Waters and Chaz Mostert in eighth. Ryan Story, managing director of Shell V-Power Racing, said the team was expecting rain within 45 minutes. Back up front, Whincup still led from Waters, but Van Gisbergen was dropping off due to high-speed understeer. James Moffat and Todd Kelly biffed and banged on lap seven with no real harm done. Van Gisbergen got close to Waters coming into Turn eight, but Waters pulled away again. A bit of rain did appear on the Kiwi’s windscreen, but conditions were unchanging at the moment. James Courtney was the first car into the pits on lap 10, taking fuel and switching to slick tires in addition to altering the rear ride height. Van Gisbergen was next in on lap 11, the first of the leaders. The Red Bull Holden driver took on fuel and slicks, coming out nearly a lap down due to the pit lane transit time. McLaughlin and Winterbottom pitted on lap 13, as did Whincup. Waters was now in the lead by 3.5 seconds over Tim Slade, and 5.1 over David Reynolds. Van Gisbergen did a daring move on Winterbottom on lap 14. Van Gisbergen took the wet inside line down into Turn five, pulling the move off well. McLaughlin was just ahead of Van Gisbergen, with Whincup in front of the DJR Team Penske driver. Craig Lowndes got pushed off at Turn six by Jason Bright on lap 15. Waters pitted on lap 16, dropping him to eighth, just behind the effective leading pack. Todd Kelly and Simona de Silvestro were 1-2 for Nissan, with Whincup in third. McLaughlin and Whincup did a bit of argy bargy heading out of Turn eight. On the run into Turn nine, McLaughlin’s rear wheels hit the grass, but the Kiwi masterfully saved it as Whincup pushed him wide and didn’t give enough road to the Ford driver. Whincup got a warning from the stewards for not giving enough room. 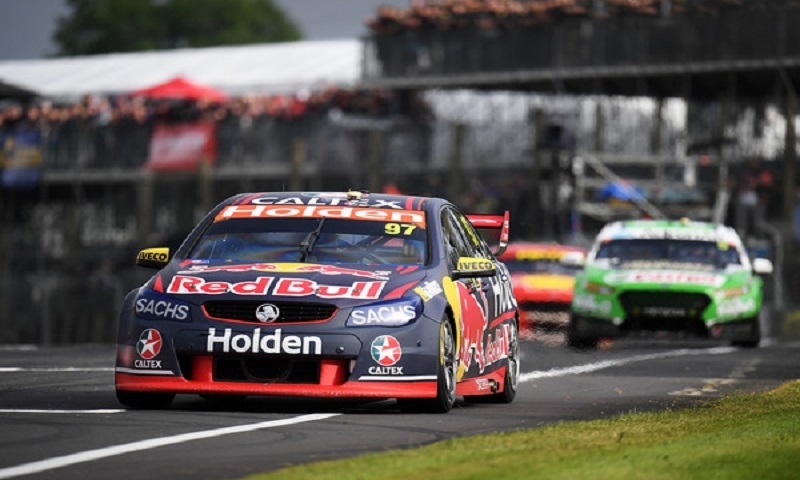 Whincup and McLaughlin continued to have a close battle for the lead, and had a car-length’s gap on Van Gisbergen. The gap was 0.374 between the two leaders, and while McLaughlin closed through Turns one through four, he would lose time on the back straight. McLaughlin closed up up into eight, which allowed him to make more of a run through Turns 9/10/11. Van Gisbergen’s pace allowed Winterbottom to close up on him on lap 25, but nothing came of it. Van Gisbergen looked to be in the catbird seat for the lead as he conserved his tires. McLaughlin began to push ever harder, hoping to have Whincup make a mistake, though the Ford driver locked up heading into Turn eight. McLaughlin tried to dive underneath Whincup on lap 30 at Turn eight, but though he got the Shell V-Power Falcon alongside the Red Bull Commodore, he couldn’t pull off the pass. Coming through Turn 11, McLaughlin tapped the rear bumper of Whincup, luckily with no damage done. The incessant battling between the two leaders allowed Van Gisbergen to close up, and the gap between the front two and third was 1.3 seconds. Van Gisbergen looked to be the big loser on lap 32, as Courtney beached his HSV Commodore. In reaction, Whincup and McLaughlin came in before the safety car came out, and Whincup pipped McLaughlin on the way out. In fact, Van Gisbergen was the big winner, as came in on lap 33, and came out still in the lead as Whincup and McLaughlin backed off waiting for permission to pass the safety car. Van Gisbergen led from Winterbottom, Whincup and McLaughlin when racing resumed on lap 37. Winterbottom closed up tight on Van Gisbergen, as he was the fastest car on lap 37. McLaughlin would finally get Whincup at Turn eight on lap 39 for third, and set his sights on Winterbottom. Mostert had to take the escape road at Turn five, losing time and position. Back up front, Van Gisbergen was pushing hard to get away from Winterbottom, but McLaughlin was closing in on the pair. Rain was coming quickly, and on lap 44, drivers began radioing in about a change in conditions, though at the moment, it was just sprinkling. Winterbottom was right on Van Gisbergen’s rear bumper, but McLaughlin wasn’t far behind. Rain was falling harder at the hairpin, and Van Gisbergen began to use his wiper as the car slid under braking. Winterbottom missed the apex at Turn eight due to the rain, allowing Van Gisbergen to gap Frosty a bit. McLaughlin began to lose ground to Winterbottom on lap 47 as the car looked to misfire. Van Gisbergen was moving the car to the outside on the way into Turn five to find more grip in the changing conditions. Rain tires were on standby in most garages, but it all came down to who would blink first and pit. Whincup closed in on McLaughlin, but slid wide at Turn one due to slippery conditions. Dale Wood piled in to the barriers at Turn four on lap 52, triggering the safety car. While the pit lane was dry, the rain began to sprinkle down on the back side of the circuit. Nobody pitted on the first or second laps of the safety car period, and when the race went green on lap 55, still no one pitted, though the skies grew black. Van Gisbergen got the jump on Winterbottom by a half-second, though McLaughlin was on Frosty’s tail. The restart was hectic, with the midfielders getting restless and bumping each other to try to make passes. Mostert pushed Reynolds off at Turn eight, and as he tried to redress it, Coulthard got into the front fender of Reynolds, sending them both onto the Turn nine grass, and Coulthard into the Turn 10 wall upside down but unhurt, though his championship chances took a beating. The safety car came out for the incident, closing the field back up. McLaughlin’s car sounded rough under the safety car, but with the laps running out, he just made do with the issue. The safety car lights went out on lap 63, and as the race went green on lap 64, the lead three really went for it. Mostert got a drive-through penalty for the incident. The race would be shortened to 66 due to time, meaning if Winterbottom was going to make his move, he’d have to do it soon. Frosty couldn’t do it, and Van Gisbergen held on to win at home.